First galette. Rosemary dough crust, filled with caramelized onions, sliced purple and white fingerling potatoes, and Gruyere. Botched up that last fold, but it still tasted delicious! The other day my wife found some tender loin steak for a good price. Salt, pepper, sear in pan and finish off (only slightly too much) under the broiler. The taste and feel were sublime! Pierogi with potato cheese filling in the Matfer. 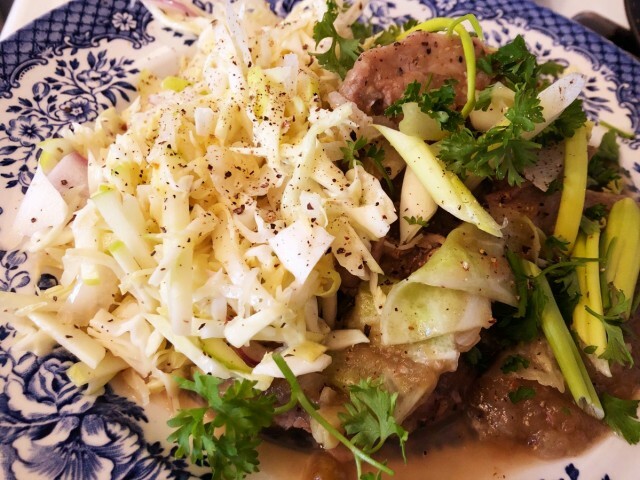 Braised a Pork Roast with cabbage,onions and Granny Smith apples and a side of tangy Coleslaw. Don't know about you guys but I've been lovin' this thread! Lamb, Spanakopita and Fasolakia that were all delicious. I butterflied the lamb, seasoned, rolled, tied and sous vide at 140F for @ 24hrs the seared off in the very hot skillet. I made a quickie jus from the bag liquid.